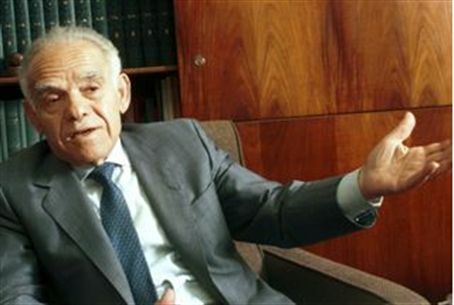 Knesset Speaker eulogizes former prime minister, who will be buried later Monday. The casket of Former Prime Minister Yitzchak Shamir has been placed at the Knesset Plaza before his funeral to allow the public to pay its respects. Shamir, who was Israel's seventh prime minister and a commander of the Lechi Underground in pre-state days, passed away Saturday at age 96. His funeral procession will leave the Knesset Plaza at 5:00 p.m. and proceed to Har Herzl, where he will be buried next to his wife, Shulamit. Knesset Speaker Reuven Rivlin eulogized Shamir, whose name means "emery," among other things, as "a solid rock… unbreakable." "Nothing could cause you to veer from your path," Rivlin said. "Tools of iron and tools of destruction were powerless before you, they could not threaten you. Deftness of tongue, bribery and smooth talk were not on your lips, they did not speak your language." "Only one weakness gnawed at you without mercy," he continued. "Only one small weakness succeeded in cracking the solid rock, quarrying its stones, and creating from them the foundations of the edifice of the Kingdom of Israel. It was love: your love for this persecuted nation; your love for the homeland of forefathers, the eternal land; your love for your children and your home; your love for Shulamit."